The Three of Disks enters Binah, the fields of understanding and perception, initiatiing the process where the project that began in the Two of Disks is viewed and understood against its surrounding i.e. in its completion.. 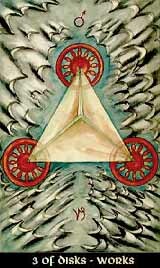 The card also talks of the alchemical wedding, in which the alchemical mercury combines sulphur with salt, thus building the living gold (the philosopher's stone). It implies the basic idea of Earth, the cristallisation of its powers and qualities, the commencement of matter to be established. The name of the card is Works, saying that work was done to get that far, thus it implies a first taste of victory, an admission that a progress was made, a big step forward on the way. Though, further work will be needed to keep the achieved status and to proceed in it.